The Golden Age of 2012 has started and Ancient Archetypal Powers are reawakening. On July 18th, the Archetype of Justice, Karuppasamy fully descended onto the Earth plane. Dr. Pillai discovered an individual who has been preparing his body, mind and spirit to be a channel for Karuppasamy. The integration process is now completed and he is available to give Karuppasamy Readings. 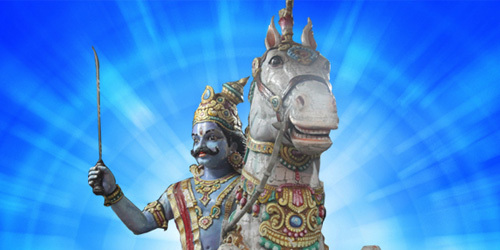 Karuppasamy has a lot of human characteristics and is very sympathetic to our problems. He is the God of Justice and has zero tolerance towards evil. He will grant your wishes, if it is for a good cause. Karuppasamy promises to help all those who seek and deserve justice, money and relationships, even couples longing for a child will be granted their wish. He gives practical advice with real solutions. Recently a person asked Karuppasamy, to make sure that he passed the exams he had just taken. Karuppasamy’s answer was not expected, “How can you pass? Almost 90% of your answers were wrong, so it is not possible. What I can do, and will do for you, is over the next year, I will strengthen and improve your mind so that when you next take the test, you will be able to pass the exam.” Karuppasamy operates from a different plane and his solutions while sometimes surprising, are very precise but most important they work. Karuppasamy Readings are now available. Our Karuppasamy reader channels the direct perceptions from the 3rd eye of Karuppasamy himself. However, as per Karuppasamy dictates, the readings are only available 2 days a week, Fridays and Saturdays. So, if you are interested, please schedule your reading today as His schedule fills quickly.